At ICP Construction, we’re proud to give back to organizations making a positive impact on the community. 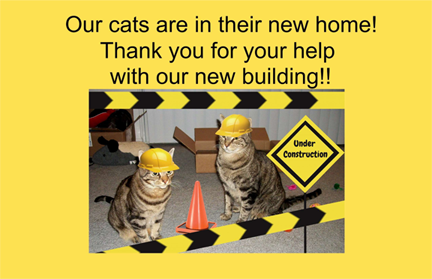 Arizona Polymer Flooring (APF), a brand of ICP Construction, recently had the opportunity to assist The Hermitage No-Kill Cat Shelter and Sanctuary with their re-build project, and we jumped at the chance. With limited funds, the shelter sought out companies willing to assist with the roof, foundation and overall appearance of the worn facility. APF helped identify the best flooring system for the shelter’s cat containment and washing areas, selecting a Granitex Decorative Color Chip Flooring System for its high durability and sleek look. APF also provided half of the material, free of charge, to lessen the financial burden. The Hermitage is a no-kill shelter and cat sanctuary that has been dedicated to sheltering and protecting homeless cats in Tucson for more than 50 years. After moving into the new space, the cats are loving their new home.